Automatically converts common table salt into all the pure chlorine your pool needs – simple, effectively and safely. Create clean crystal-clear water that is soft, silky and smooth to the skin. After the chlorine has disinfected your pool, it reverts back to salt and the cycle repeats. 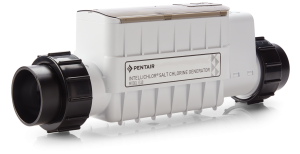 Contact Mid State Pool Liners to find out why the Pentair Intellichlor is the best Salt Chlorine Generator for your pool needs. If you are interested in changing your current chlorine system to salt, we can install a Pentair salt chlorine generator.